Not one ski but several, Salomon's X-Race varies its sidecut radius by length, allowing skiers to match the ski to their preferred turn shape. 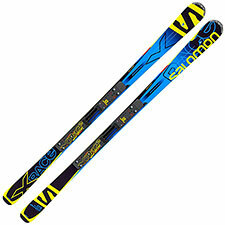 So for example if you pick the 155cm length, you'll be banging out turns on an 11-meter radius ski (! ), whereas if you choose a 180cm X-Race, you'll be cruising on a far more expansive 19-meter turn radius. That's an enormous difference—so much so it's probably pointless to try to deliver a one-size-fits-all verdict on the ski. For my X-Race experience, I tried the 163cm length, which corresponds to a turn radius of 12.8 meters. That's a very short radius—shorter than I would normally pick for myself—and in fact it falls right in the range you'd expect to find on a slalom racing ski. The question, then, is who is this ski built for? Certainly there are skiers who prefer to ride slalom skis even when they're not on a race course. There aren't many of them, but they're out there. Inevitably they're former racers, slalom was probably their best event, and if you do happen to catch them on a mountain, they're probably stitching down the groomers like a sewing machine, making two turns to your one. Problem is, skiers like that are generally right at home on actual racing skis—they can pull a WC slalom plank right off the rack and go to work. True, the X-Race ski (or line) borrows much of its design, construction, and technology from the race room, but to be fair these are significantly detuned from race stock, and I'm not sure that makes sense in the slalom radii. How does the 163cm X-Race feel? Very, very quick and surprisingly 'loose.' That subjective looseness is likely due to some tip and tail rocker, as is the fashion in today's nouveau-elite frontside carvers, and it makes turn initiation very easy. Perhaps too easy. In my notes I called the X-Race lively to a fault, meaning the ski felt nervous and even hyper underfoot.